A ward of the state of Illinois from nearly birth, Victor Feraru spent most of his first 17 years between 40 foster homes, three groups homes and visits with biological family members. The situation was such that Feraru, who grew up in the Peoria area, did not expect to live beyond that. 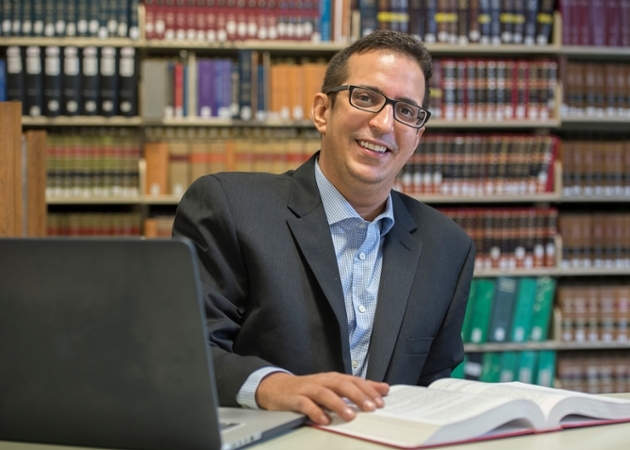 Yet through his own strength, determination, and support of a family who adopted Feraru after he became an adult, the second-year law school student at Southern Illinois University School of Law now has the opportunity to assist children facing similar situations across the state. Feraru was recently appointed by Illinois Department of Children and Family Services Director George Sheldon to the agency’s Children’s Justice Task Force. His first meeting was last week in Chicago. Bringing his experiences to the task force as both a law student and a survivor is “very humbling,” Feraru said. He wants to offer a unique perspective and provide hope for children facing similar situations. “Many people see it from the top down, so I’m able to give them a perspective from the bottom up,” said Feraru, who is 35. “I think people who have been in my position – the statistics bear it out -- they don’t make it here (law school). Veronica Resa, DCFS deputy director of communications, said the agency is much different than it was in the 1980s and 1990s when Feraru was growing up. During that time, there were about 50,000 children in the system; now there are about 16,000. The agency emphasizes being proactive to get families assistance to keep them together, if possible, before children come into the system, she said. “I think we are doing a lot better serving families and we are working on prevention as opposed to waiting until a family is in crisis,” Resa said. At age 16, Feraru was in an adoption process when the couple, who lived in the Quad Cities area, died. He was emancipated and no longer a ward of the state a year later. Feraru would go on to earn a bachelor’s degree in English writing from Guilford College in Greensboro, N.C.
A lady from High Point, N.C., and her family heard of Feraru’s story during an Air America radio broadcast when he was in his early 20s. He credits their support, encouragement and love with his success. The family legally adopted Feraru, who changed his last name, when he was 28. Feraru did not plan to return to Illinois after his foster care experiences. Though he had other choices for law school, Feraru said he was comfortable at SIU School of Law, and views his decision to attend law school in Illinois as symbolic. It was an “immediate connection to the faculty,” which he described as compassionate but which also challenges students to do their best. On the task force, Feraru is representing the legislatively mandated task force position of an adult survivor of child abuse and or neglect. Belleville attorney and retired 20th Circuit Court Judge James M. Radcliffe recommended Feraru for the appointment. Members can serve up to two, four-year terms, for a total of eight years, and Radcliffe is leaving the task force after serving eight years. Feraru “has an understanding of the instability that a lot of kids experience in the system and appears to me to be a really bright guy,” said Radcliffe, who was a judge for 20 years and presided over juvenile cases in St. Clair County before retiring in 2007. The task force has been instrumental in several improvements regarding child services in Illinois, including the implementation of statewide child advocacy centers, Radcliffe said. Feraru was an extern this past summer for Staci M. Yandle, U.S. District Judge for the Southern District of Illinois in Benton. She said her general impression of Feraru is that he is very energetic and takes his responsibilities very seriously.